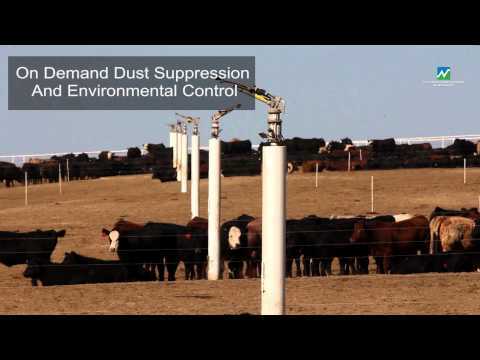 Nelson Big Gun® Sprinklers are ideal for feedlot dust suppression and cooling applications. With a full range of models available, flow rates of 30-1200 GPM (6.8-275 m3/hr) can be achieved with maximum uniformity. and watering the remaining debris. Big Guns can be installed in a permanent Solid Set system or can be part of a portable move system. Careful consideration needs to be given to riser construction and mainline installation due to the mining effect noted in long-term operations. Flushing and draining for winter shut down need to be one of the initial design parameters to prevent damage from freezing.